Mountnessing Postmill0333 013 2738 work WindmillThe nearest Essex mill to London, Grade II-listed Mountnessing Post Mill is often photographed and sees many visitors. The present mill was built in 1807, probably incorporating earlier timbers. There are records of a windmill on this site as early as 1477. It has four floors, four spring sails and two pairs of millstones. It is in full working order and occasionally mills flour. The mill can be turned to the wind by pushing its long tail pole – children on school visits enjoy trying this. 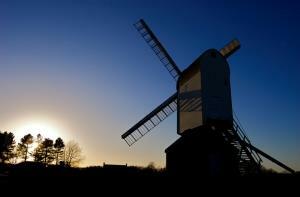 The nearest Essex mill to London, Grade II-listed Mountnessing Post Mill is often photographed and sees many visitors. Taken into public ownership soon after it stopped operating in 1933, the mill was fully restored and is now maintained by Essex County Council and Friends of Mountnessing Windmill. Take the Mountnessing turn off from the A12 onto the B1002. Mill located in village centre.